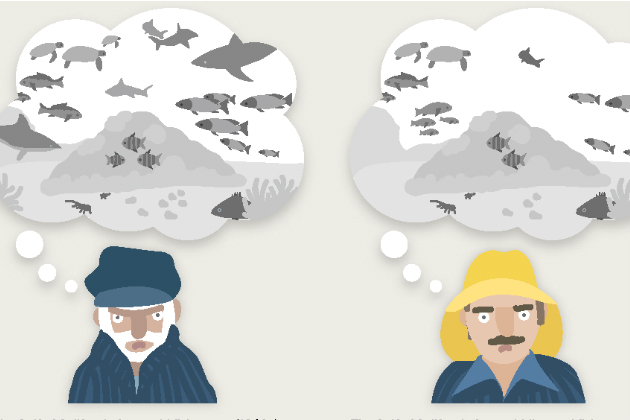 Even if we sum up every type and category of protected area, only 3.5 percent of the ocean is currently protected. And only 1.6 percent is strictly or fully protected, like the Ross Sea. 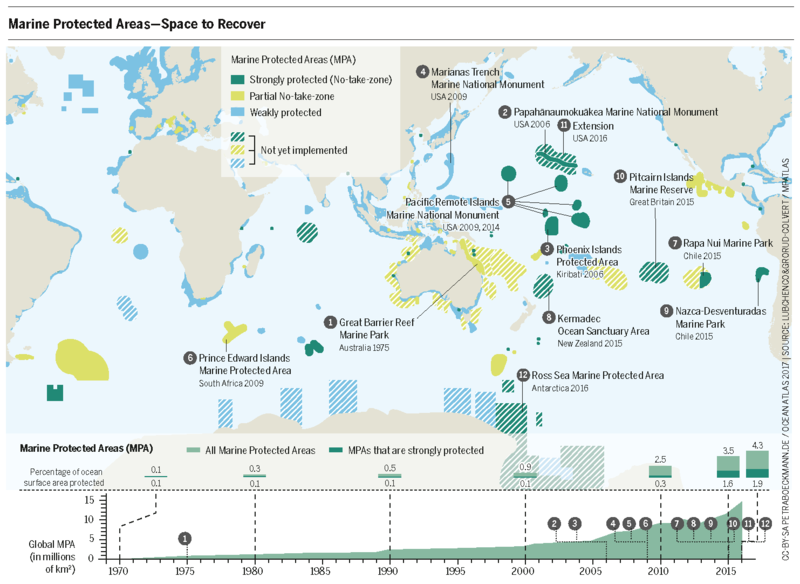 Designated as a no-take zone in 2017, the sea is now the largest marine protected area in the world. For the next 35 years, all types of exploitation are prohibited in more than 70 percent of the area, while the rest may only be used for limited research purposes. Environmental organizations and scientists demand that between 20 and 50 percent of the ocean be designated as protected areas. The goal is not to preserve things as they are – even in protected areas we see only a tiny fraction of the biodiversity that once existed – but to allow life to recover. A thousand years ago, you could catch fish in many regions with nothing more than your bare hands and a net. Just 500 years ago, gray whales and right whales, whose meat was prized on the market, were a common sight in the North Sea. A few hundred years ago, sea turtles still teemed in the millions in the Caribbean – it is said that Columbus’s men complained that they couldn’t sleep because of the racket made by the gigantic animals constantly colliding with the ships’ hulls. In the 17th century, there were still 90 million green sea turtles. Some dubbed them soup turtles because they served as ample freshmeat for seafarers and later as delicacies for the wealthy back home. Today there are only 300,000 of them left in the Caribbean. And it wasn’t just the populations that were huge: so were the creatures themselves. At the start of the 20th century, fishermen pulled sturgeons more than three meters long from the Elbe River in Germany. A manta ray weighing 2,200 kilograms was caught off the east coast of the USA. Today, though, there are hardly any big fish left. The reason is the fishing industry. Fish are caught before they have a chance to grow. It is an old lesson that we are slow to learn. 2,000 years ago, the Romans commercially fished 150 different species. And the colonization of the new world in the 16th century had fatal consequences for more than just the green sea turtle. The history of whaling provides an excellent example. Whalers said the right whale got its name because it was the right one for whaling: as a coastal, slow-moving whale they were easy to catch, they floated at the surface when killed and yielded a lot of valuable blubber that was then boiled into oil. People first began hunting them around 1000 A.D. As their ships grew more seaworthy, people pursued the whales further into the ocean. In the 18th and 19th centuries, the height of whaling, the right whale was hunted from the southern Atlantic to the northern Pacific. And as a consequence, the right whale was nearly extinct by the start of the 20th century. Humanity has grown rapidly, especially in recent history. Our respect for nature has not kept pace. Whole species have been sacrificed for new fashions and trends. People wiped out entire colonies of sea birds just to pluck their feathers for fashionable ladies’ hats. And some old culinary stories sound dubious today. Can you imagine that lobster was so cheap in Boston in the 1890s that it was served for lunch in prisons? Then as now, we often view the ocean as an unlimited supermarket. But if we still believe that the ocean is full of life, we are fooling ourselves. What we try to preserve and restore in the protected areas are just the remnants of the much greater richness and diversity that once existed. 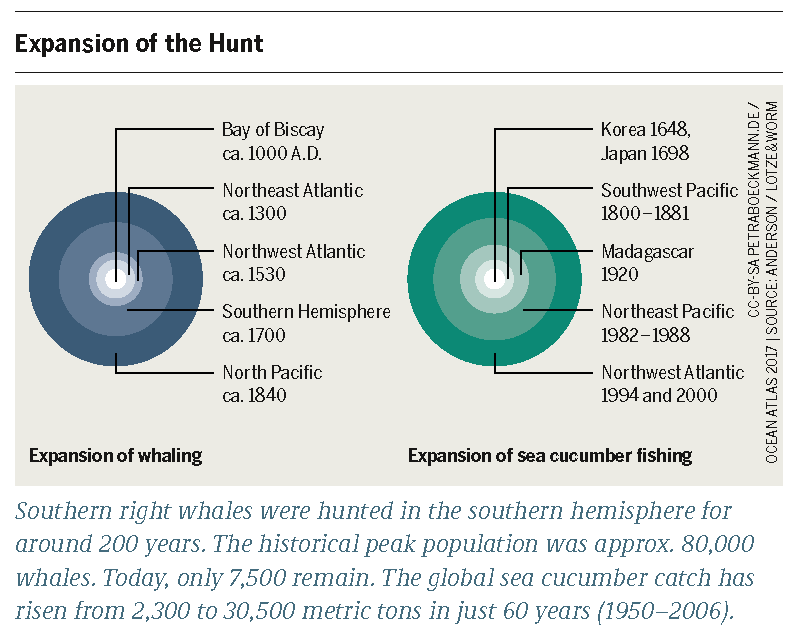 In one way, at least, we have become cleverer: we hardly hunt large marine mammals anymore. That’s a start, but it’s not enough. The sea cucumber is prized as a delicacy in Asia. Up until 50 years ago it was only fished regionally. In the intervening years, though, the sea cucumber industry has spread across the whole ocean. They aren’t as cute as baby seals, so they also aren’t as well protected. And so history threatens to repeat itself: perhaps one day our grandchildren will look back on the vanished sea cucumber with the same sadness that we now feel for the loss of the whales.